The unit's setup features allow it to immediately locate and lock onto the strongest available wireless frequency as soon as the transmitter is docked in the receiver. 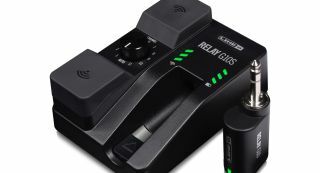 The Relay G10S' receiver is equipped with RF and Battery Life indicators on its face, plus a 9-volt DC power input, making it compatible with standard pedalboard power supplies. An external power supply is also included.